Question: I have a pushmatic breaker box in my house and need to put in an arc fault breaker for a new bedroom addition. Since they don't seem to make an arc fault pushmatic, my inspector told me that I can run a seperate six panel box next to my old one for the arc fault breaker. This is how I understand they procedure and want to make sure this is correct. I need to put a 2 pole pushmatic in my main box and then run the wiring from that to my new box. I need to have 2 hots to the subpannel, a neutral to the neutral bar and the ground on a seperate bar. Does this sound like the correct way to do this? I really need to get moved into the room asap and want to do it right the first time. Thank You. This is a funny and scary question. Your inspector should know better but he could be just a general inspector. The bigger safety hazard is the pushmatic breaker box. You need to replace that. Do some google searches on pushmatic and safety and you will see that this breaker have issues. 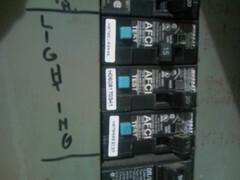 (http://www.inspect-ny.com/electric/Pushmatic.htm) The Arc Fault breaker are new and a more advanced safety device. You really should have an electrician replace the whole electrical service. Other wise you will just be wasting your time.